The nominated FO leads and manages the Bushwalkers Search and Rescue members on each search, under the direction of the Police. A group of about ten very experienced members have been designated for the FO role. The first FO available when the call-out commences takes on the job for that particular search. The FO will usually appoint a deputy. Together they will represent BSAR volunteers at all discussions and planning meetings. They will give all instructions to members, either directly or through the Group Leaders. Searches work best when either or both the FO and deputy remain at the search base almost all the time. The official contact with the Police is through the FO, but in the field this may not be practical. Once in the field instructions from the FO come via Police radio. 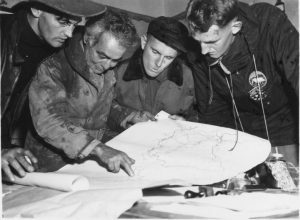 For detailed information on the role of the FO, see the Bushwalkers Search and Rescue booklet “Field Organiser and Police Liaison Officer Notes and Check List”. The normal organisational structure for BSAR members on a search is the formation of search groups of four members. Usually while being transported to the search location, the FO will select Group Leaders from the members who have responded to the call-out and form the search groups around those leaders. Even though your Club may rate you as a leader, you may not necessarily be used in that position in the field. Having many competent leaders is one of our real strengths. By working in small teams, everyone can make a significant contribution of ideas and skills, so your experience will not be wasted. Members of the group must take responsibility for first aid, radio communications and navigation. The FO will attempt to form balanced and self- contained search groups of two or more members. This is generally achieved by grouping people from the same club, who may have walked together many times. The efficiency of the group is enhanced by their mutual confidence. At search base (as elsewhere) it is essential to stay with your group. If you have to briefly leave the group ensure that your leader is informed of your whereabouts, so that you may be readily contacted if needed at any time. As BSAR acts as an independent body for administration, all checking in and out at search base must be through the FO. Experience over many years has suggested that Group Leaders are the key people in the successful operation of BSAR. Search Group Leaders are the vital link between the FO and the searchers. They are responsible for ensuring that the search tasks are carried out in the best possible way, communicating progress of the search to the FO and search command and ensuring the proper management and well being of their group members. Group Leaders receive a briefing and relay instructions to group members. They are responsible for ensuring their search groups have sufficient equipment and food before departing search base on their assigned tasks. They are responsible for ensuring their search group functions as a coherent team throughout the search, both in the field and at base. They also have responsibility for passing on information and suggestions from the group to the FO. 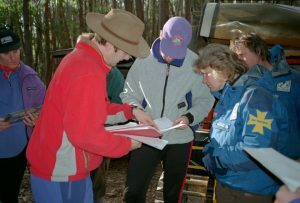 The Group Leader’s briefing of the search group will cover such matters as the general situation (if this has not already been done), the search tasks and the type of search technique to be used, basic radio arrangements, call signs, transport, group organisation, collaboration with adjacent groups, food and equipment requirements, and arrangements for excess equipment left at search base. Group Leaders should stress to their group the importance of re¬maining together at every stage of the search. A clear understanding must be reached on the course of action the group is to follow to re¬unite the group if one member should become separated in the field. Group Leaders should remember their responsibility for the wel¬fare of their group. Searchers are always expected to be prepared to undertake difficult and sometimes physically demanding tasks, but in the event of exhaustion or injury of a group member, the care and evacuation of that person takes priority over the continuation of the search. Group Leaders should keep the FO informed of any developments that may affect the running of the search. have attended at least one training event in the last five years.